I have been working today on making a video to explain DNA structure, chromosomes and cell division to post on YouTube. This has proved harder than I anticipated (not just because I look ridiculous and keep stuttering….) but I hope there may be something for you by lunchtime tomorrow…. Firstly DNA is from the family of molecules called Nucleic Acids. 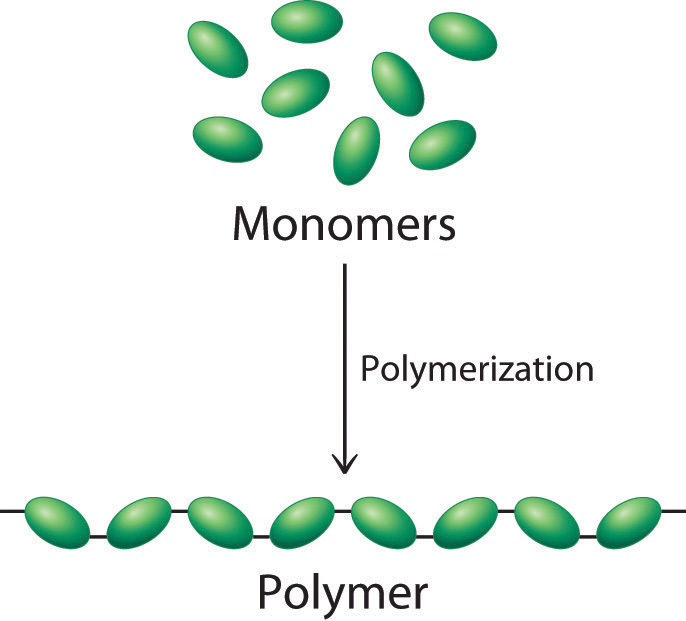 These are examples of biological polymers (macromolecules) and you should know that a polymer is a large molecule made of a chain of repeating subunits. The monomers that make up a DNA molecule are called nucleotides. 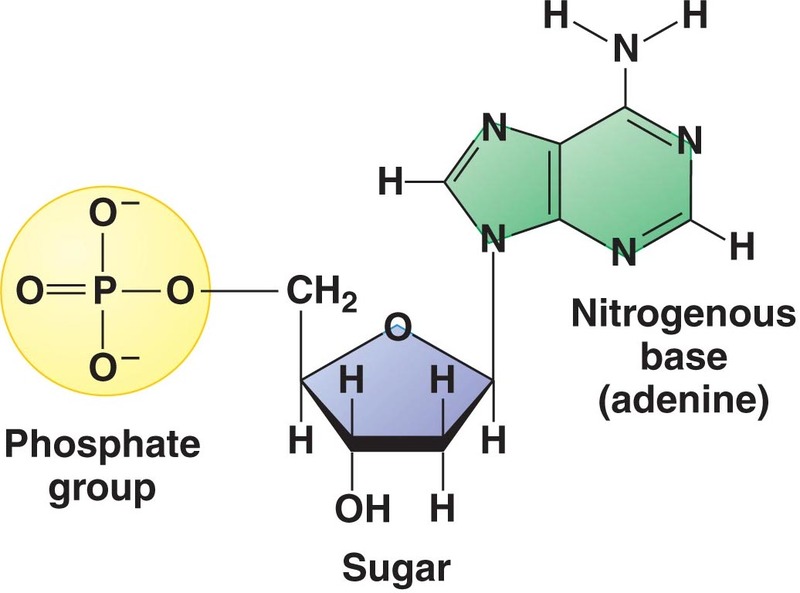 A single nucleotide is made up of a phosphate group attached to the sugar, deoxyribose which in turn is attached to a nitrogenous (nitrogen-containing) base. Every nucleotide in DNA has the same phosphate group, the same sugar (deoxyribose) but there are four alternative bases in DNA nucleotides. You don’t need to worry about the structure of these four bases but you do need to know their names: Adenine, Guanine, Cytosine and Thymine. Can you see why the two strands that make up the DNA molecule are described as being antiparallel? 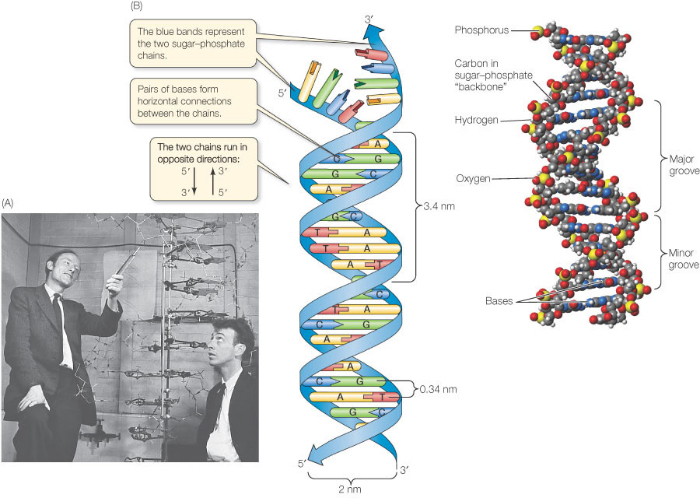 Firstly it is appreciating how long the actual DNA molecule might be. The diagram above shows a structure 5 base pairs in length. The DNA molecules in the nuclei of your cells might be hundreds of millions of base pairs in length. If you look at the sum total in a single human nucleus there are DNA molecules 3 billion base pairs long – a molecule that if allowed to line up in a straight line would extend to around 2 metres in length. And finally the fact about the structure of DNA that everyone remembers – it is a double helix. The two sugar-phosphate backbones do not run in a straight line as in the diagram above but coil around each other into the infamous double helix. October 10, 2015 - 8:41 am Pingback: DNA is Unstable! Luckily your Cells can handle that. | Check This Science! I am a little confused about chromosomes – they exist in 23 homologous pairs, but I’ve seen images of them as single ‘lines’ with a centrometre, made up of one chromatid (thus in each cell there are 46 ‘strands, and 23 homologous pairs’), but also as an X shape with two sister chromatids, and you say that they exist as X shapes because they only become visible just before mitotic division, right? So if I was asked to draw a chromosome in an exam, do I draw an X shape or a single line? What’s the definition of a chromosome in the form of a diagram? Ah so chromosomes are initially strands then at some random point the DNA of that chromosome duplicates to form two sister chromatids and then the resulting cells after mitosis will have a single strand and the whole process begins again? But initially, the chromosomes are a single structure but we can also think of them as X shape because they exist as that a lot of time before division?